In its recent decision in the case of Cracker v. State Farm Mut. Auto. Ins. Co., No. 11-0225, 2012 U.S. Dist. Lexis 109357 (W.D. Pa. Aug. 3, 2012 Lancaster, C.J. 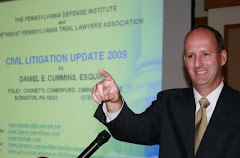 ), Judge Gary L. Lancaster of the United States District Court for the Western District of Pennsylvania denied State Farm’s Motion In Limine to bifurcate a breach of contract and bad faith post-Koken lawsuit. In this matter, State Farm asserted that bifurcation was appropriate because the issues to be decided on the UIM claim were entirely separate from the issues to be decided on the bad faith claim. State Farm also argued that a verdict in its favor on the UIM claim could render the bad faith claim moot. The Claimant opposed the Motion by arguing that bifurcation would be ineffective in this case because the issues and evidence overlapped and because the UIM and bad faith claims were not dependent upon each other under Pennsylvania law. After noting that the bifurcation of a trial is within the court’s broad discretion under the Federal Rules of Civil Procedure, and after outlining the factors to be utilized in determining whether such a motion should be granted, the court found that bifurcation of the trial was not appropriate in the case before it. Judge Lancaster noted that the there was a considerable overlap in the issues presented in that essentially the only issue in dispute in the UIM claim was the valuation of the Claimant’s injuries, which issue was noted to be a central issue in the companion bad faith claim. The court also noted that the parties’ Pre-Trial Statements confirmed that many of the same witnesses would be required to testify in both phases of the trial. As such, Judge Lancaster felt that it would be a waste of judicial resources and cause inconvenience to require those witnesses to testify twice in the same trial. The court also rejected State Farm’s argument that both parties will be prejudice if bifurcation is not granted as the testimony of the trial counsel may prove relevant in the bad faith claim. The court noted that both parties had the ability to use substitute trial counsel, if necessary. Overall, the judge found that the potential prejudice to a party presented by this situation was outweighed by the court’s obligation to promote the expeditious resolution of the matter, i.e. the interest of judicial economy, particularly given the overlap of the issues and evidence. Based upon this rationale, the court denied State Farm’s Motion In Limine to Bifurcate the Trial. I send thanks to Attorney James Albert of the West Pittston law firm of Cefalo & Associates for bringing this case to my attention.